CONTENT! Scheduled content that is. So, these posts have already been posted to my page by this point but they were extremely easy to create and then just let be! What a great tool! I could have created as many as I wanted and just scheduled them out as I wished. That is so convenient and a really great way to keep content consistently on your page. As a business owner life can get busy. So have a day dedicated to creating and scheduling content seems smart to me and facebook makes it fairly easy to do. I chose to post a couple of articles relating to marketing yourself on social media. One of the articles I posted was about Youtube marketing and I chose that article because of a post I had made earlier in the week that said that videos are a highly successful marketing tool. I included a funny meme to catch viewer attention. The next post I posted was about creating content. I think my viewers will respond well to these posts because they relate directly to why someone would be following my page in the first place. They are looking for ways to boost their business online and on social media so these little tips and tricks should be interesting to them, but they aren't enough to completely eliminate the need for my services. I tried to choose pages that were posting current content and posting frequently. I also tried to choose pages that were relevant to what I'm trying to do with my career so that I can learn from the way the pages are being utilized. I'm also hoping to be able to share some content from the pages I follow. This week I started a Facebook business page for a business I completely made up called LinkUp Social Media Consulting. It has exactly 0 likes currently but I have high hopes for its pretend success. Ok jokes aside, this experiment has already been a huge learning experience. Despite having never owned a business before I have run "Pages" on facebook before and had no idea how to use the pages features. So we'll go piece by piece starting with reach. Reach is how well your content is "getting out there". Your pages reach shows how many people see your content and how well its getting out into people's newsfeeds. Engagement goes beyond reach and is almost self explanatory. Engagement shows how often your audience engagement with your content through likes, clicks, comments, etc. NOTE: It is pointed out in the above article, and I think important to remember, that a wider reach may lower your engagement stats. Facebook Insights allows you to keep track of your reach to see how well your posts are doing (and this will help you to keep track of how well your social media investments are doing as well). 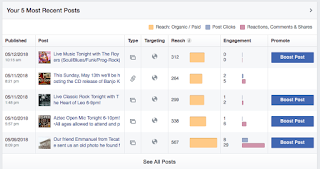 Insights then allows you to track which types of posts illicit the most engagement from your audience. Getting a good look at what type of content attracts your viewers is important. So, for example, if polls don't get much engagement then don't bother! But if videos are getting a ton of engagement focus your efforts there and on creating better quality videos for the future! Please give it a Like!